The Congress members were joined by other opposition parties like TMC, Left and RJD with their members trooping into the Well and forcing the adjournment of the proceedings. NEW DELHI: The Congress today accused the government of "complete failure" in dealing with the plight of farmers but the treasury benches in the Lok Sabha claimed that the Modi government had worked more for them than any other dispensation. 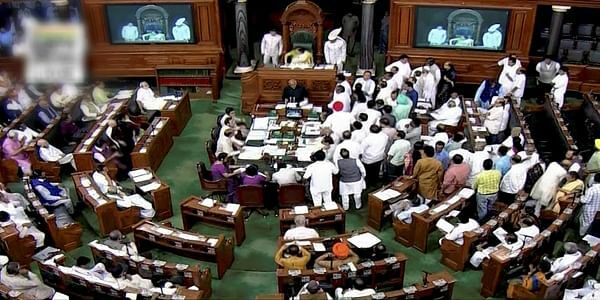 The Congress members were joined by other opposition parties like TMC, Left and RJD with their members trooping into the Well and forcing the adjournment of the proceedings for nearly an hour as soon as the House met for they day. The opposition members raised slogans in the Well slamming the government for allegedly ignoring the well-being of farmers. BJP ally and Swabhimani Paksha (SWP) MP Raju Shetti also sparred with the treasury benches over the issue. When the House met again at noon, Leader of the Congress in the Lok Sabha Mallikarjun Kharge attacked the government again, despite Speaker Sumitra Mahajan saying that a debate on the issue was scheduled later in the day and Parliamentary Affairs Minister Ananth Kumar saying that the government would answer all questions raised by opposition members. "There is an agrarian crisis. The agriculture sector is devastated. The number of farmers committing suicide have been rising by the day. The government has completely failed in dealing with their problems. "Their loans should be waived and the government should fulfil its promise of paying them 50 per cent more than their input costs," Kharge said. Countering him, Kumar said no government had done as much for farmers as the Modi dispensation had. The government was ready for discussion under Rule 193, which does not entail voting, and answer all questions. Protesting Congress, NCP, TMC, Left, RJD and National Conference members then staged a walk-out. Earlier in the day, opposition members had stormed the Well and raised slogans. "Do not interrupt the House. Let us debate," Kumar said. But the opposition members, including those from the Left and the RJD, continued raising the issue from the Well. Most of the Congress members, who were also in the Well, raised slogans such as "Mann ki Baat band karo, karza maafi shuru karo (stop talking on radio programme, implement loan waiver)" and "stop shooting farmers". Prime Minister Narendra Modi was present in the House during the Question Hour when opposiiton members were protesting. An apparently peeved Speaker Sumitra Mahajan said the opposition was not interested in the proceedings to run and adjourned the House for 50 minutes till noon. Later, Shetti attacked the government, saying Modi had promised farmers during the election campaign in 2o14 that they would be paid for their produce 50 per cent more than their input cost. Raising the issue of farmers' death in Mandsaur in Madhya Pradesh, Shetti alleged that the oen of them was killed by police after being summobed to the police station. "Is the farmer a terrorist? We need a CBI probe into the matter," Shetti said. Shetti was interrupted by a BJP member, and joined by another BJP member Kirit Somaiya. However, Shetti, an MP respresenting Hatkanangale in western Maharashtra, hit back and said, "I have asked votes for you (the BJP), so I have to ask this question." He walked out in protest saying "he was not being allowed to raise the issue related to farmers and he condemns it".